Some will say that Gor Mahia fans were recently responsible for torching a vehicle belonging to the City of Nairobi. However that was a case where Gor Mahia fans were dangerously and rudely provoked. 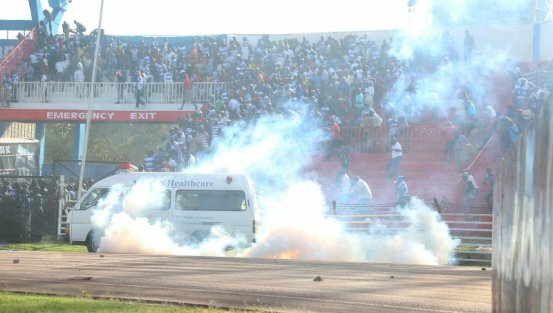 A city of Nairobi employee committed an act for which he should be charged with attempted murder by running over several Gor Mahia fans with a vehicle. Any group of people be it fans or the general public would react with anger at such an action. In this case, AFC fans had no case. Their team was soundly outplayed. The handball by Jackson Saleh was as clear as day. The referee decision as the correct one. The only reason AFC fans rioted was because they sensed another defeat in what has been a futile season for AFC. With these kind of gratuitous riots, the game of football in Kenya cannot progress. Getting sponsorship for either of these clubs will be difficult because the behaviour of one set of fans reflects on the other one. Give AFC ther points they deserve them they created enough mess. There dared anyone take them penalty. They did not shy away from ensuring another way would give then the points. Now that they’ve a chance for boardroom decision please please give AFC the three points. Dont be petty! that was a clear handball and the fans who started throwing missiles on to the field protesting the refs call were clearly AFC fans, there is clear video evidence contrary to your claim to suggest the ref biased, be objective and stop being petty! Very bad,very disappointing indeed, we were going to win this no doubt. This match must be played to the full, we must beat this Ingwe in the field. Some of them are happy saying that it is better to lose in boardrooms than in the field, thats utter nonsense and does not help the game of football. To Gor EC, if it is true that there was a shortage of ticket by about 2pm then you lost it. That crowd was money for us only to be taken in an orderly manner, poor organization. AFC has outlived it’s usefullness in Kenyan soccer. Watching that game there was no challenge AFC was giving Gor. Mathare can do a better job. The debate that Gor needs AFC to offer challenge nolonger holds any water. AFC is supported and maintained by a ppl who cannot offer it anything but stress. I bet this club will no be in the league in the nxt three years. Gor fans should nolonger be bothered by the happenings of this so called derby. We got the 3 points and r getting towards taking the league. That is the most important thing. Wether Afc and it’s fans feel like they want boardroom decisions or they want decisions on the pitch then that is their problem. Being cowards they will fight many battles. With Gor this is done and dusted can we now focus on the nxt target. Congrats to the boyz for showing a great game. What I saw is that the team looked relaxed and the boyz took it it easy. But I do have issues with the Gor defence. This current set up is weak and needs improvement. But realistically we will neva know who would have won, pliz remember outplaying ur opponent is not scoring neither is it winning a penalty, when the game was called off it was still 0-0. @jathur gi ji well said, this madness has always been witnessed and it was expected but it is sad our security has never even attempted to change tact. let us not castigate Ingwe fans when it is clear that both teams have hooligans within n finally 4 those who think Ingwe will go down pole bro Leopards is hia 2 stay! if what you say is true why dint Ingwe fans allow the penalty to be taken or the game to continue for that matter.. It was just a matter of time before Mighty Kogallo scored and then a barrage of goals would follow…. In a s much as agree Leopards has 9 lives, i think all indications are if things continue in the same manner then your team will go down… A derby yet Gor fans made 80% of the capacity??? and its a derby???? so how is your capacity when you play All-Stars in Nakuru???? To @ingo and Igwe we will still win the league. Since AFC could not stay on to loose to Gor, we leave them to smaller teams to beat them. Will they stop every match. Where will they get the fighting spirit to take them to the end? Will Loga be back at the “smokin’ bench”. I did not why AFC honored the match if they felt so unprepared but still were unwilling to loose. This is what I call football radicalism “why cant AFC just appreciate they are miles away from Kogalo. They are using our 2010 coach, half of Gor former players etc. they have just stagnated and having dreams. only dreams. To Kogalo funs, all that looked like video game of football. We watched and got entertained. The policemen watching them on NTV were only chasing after gor players as if they were fighting alone.wait untill they start calling Raila’s name them loosers.Anyway can someone tell me whts wrong with our officials?they knew this was a derby then printed tickets as if they were expecting a church choir.shame on them. The policemen watching them on NTV were only chasing after gor fans as if they were fighting alone.wait untill they start calling Raila’s name them loosers.Anyway can someone tell me whts wrong with our officials?they knew this was a derby then printed tickets as if they were expecting a church choir.shame on them. It was like men playing against boys,so easy. Outplayed,out thought and clueless,what other option did they hv other than running away to prevent shame? Afc ceased to be the fearless wild cat.It now a domestic cat that offers no challenge.Totaly harmless.I feel uncomfortable when Gor and Afc are mentioned in same sentence bcoz there’s no comparison. A penalty call is not necessarily a goal…the sooner goons get that into their heads the better!! However,where was the much hyped security?as the home team we are partly to blame. First,we couldn’t serve fans with enough tickets yet we knew they would turn out in large numbers and secondly why didn’t we create a buffer zone between the 2 sets of fans and get extra security personnel just in case? These games are generally a recipe for chaos depending on what happens on the pitch…but as usual we choose to ignore the obvious.now a game name has been soiled!! It was like men playing against boys.So easy,no challenge and beautiful to watch.Outplayed,out thought and clueless,what other option did Afc hv other than running away and sensing defeat? SHAME ON EEH EHH FUSI LEOPARDS, violence won’t help in any way, mayby Indeche could have saved the genuine penalty, you don’t even believe in your players. We agree that hooligans are on both teams but EEEHEEHFUSI leopards should style up! When Jackson Saleh “Octopus” handled the ball in the box against Congo Brazzavile there were no complaints of a dubious penalty. He repeats the same against Gor Mahia and this time it is a ‘dubious penalty awarded to Gor’! Ingo please rise above myopic and tunnel visioned way of reasoning. The Octopus himself acknowledged that he handled the ball in the box. Many Efusi fans including Gilbert Selebwa are not disputing the call. In any case who says that a penalty is a goal? It is a pity that our national team coach, BW, was not in place to see how his reliable defender is ‘very consistent’. I cannot blame the Octopus for being so consistent with handballs because it is evidence of lack of fitness. Lack of fitness for the entire Efusi squad was confirmed by all substitutions being made by the 60th minute. It is the Efusi fans, who of late have the habit of forcing match results “to favour them or else” that are responsible for this poor state of the team. This includes people like Ingo who don’t want take responsibility for their team and are instead living on Oguda phobia and seeing every devil as Gor Mahia. Those blaming this Efusi behaviour on lack of security, what does security have to do with fans who do not want a penalty to be taken? Fans who have sensed defeat, but are not men enough to embrace the defeat. For the pride I have in Gor Mahia I sincerely wish this match could be replayed so that they are beaten comprehensively. However, fans should never be allowed to force their wishes in a game and that is why a replay will be playing to the wishes of the cowards. Interestingly, Kenyan media as usual is very silent on the behaviour of Efusi fans. .Football lovers are found in Gor Mahia.We painted the stadium green n we were relaxed watching how luhyas were showing their level of ignorance.Big up Team Kubwa. Admin when I made a comment about wajaluo you got very emotional and pulled my comment . Now Meshack here is abusing Luhyas and you have nothing to say? Nilikwambia wewe ni mkabila asili. Maybe on an Afc site you’d b able to…hehee when will u realise that ur hate has no effect on Gor. Check where ur team is going, don’t u guyz care? Don’t worry there will most likely be be another match against AFC in the GorTv (FKF sleeping on this) or Top 8. Calling for accountability and transparency from GM “bloated” EC my friend don’t get me started. Just read the archives. However Mutahi Ngunyi wants to twist the UK’s support to mighty K’galo is his own problem. Some advice Oga on Top stop seeing Mighty K’galo through political lenses mara “Sugar Barons”, mara “accepting handouts from UK”, mara “we are poor” but rather see Mighty K’galo as a club that is proud of its origins and has brought a lot of pride to Kenya as a whole and its supporters who cut across the broad in particular. Guys, we must stop being complacent. Even our supporters are vulnerable. I still suspect our supporters were quiet just because things were going their way. We were attacking and it looked like it was only a matter of when to score. We still need to do a lot to contain our own. We must pick out those trouble makers on our side and deal with them. So far we have been good but I suspect this is only coz results are favouring us. Ama vipi? I agree with you totally PMawego, we still have those yobs amongst us even as today we happily point fingers at Ingwe supporters. The police must do their work, arrest and have people jailed for deterrent periods. Yesterday I thought I saw some being arrested, lets hope there is going to be stern actions against them. Definitely the reason we were well-behaved was because we were the stronger team as we have for the last 3 years. But within us we have an even potent situation than ingwe. We need a lot of football fan education for our fans. It even seems that some were getting more thrills hurling missiles to ingwe fans than cheering our team. Makes you wonder why some went to the stadium. @jathur gi ji and Pmawego I do share in your observations and I’d like to point out that Gor Mahia’s share of hooligans have definitely taken note of yesterday’s happenings and will in future apply the same. If this game is awarded to us then our hooligans will take a cue and apply the same in games that will not be going our way. Footage of the Gor Mahia fans in the terraces yesterday, shows one young man brandishing a CATAPULT and even rehearsing its application. Why in God’s name should a grown-up man in his right senses carry a catapult to the stadium? The AFC fans have lost it completely. The rival groups within them have resolved to completely sink the Team. Gor was just an excuse. Saleh’s handball was very obvious and there is no case to answer. The match officials were very patient and non partisan. It is pathetic to say that they favored Gor. They would not have disallowed Gor.s goal no body took a fuss at it. Am just wondering about the possible consequences? They are sinking the club. I think AFC should just take a break so that the house to be put in order. Hooligans be they Gor or AFC need to be dealt with in a accordance with the law. However, i was disappointed with our ticketing. Cant we come up with better ways of handling ticketing to avoid the kind of chaos witnessed yesterday or is it by design? Why cant we have several selling points and entry points which then can be easy to handle and provide easy access to those willing to pay and watch the match. Let people like INGO, stop using this page to inflict unjuries on us again beside the one we got on the Pitch, is it the Security who kick the penalty or players. If those people incharge of running Football will bending the rule to favour AFC, then Gor Mahia better refuse to honour the Match again. AFC, fans are there to add problems to the Club than helping them. Gor Mahia has been without sponsorship for so long but they keep on going but not like AFC who just lost sponsorship resently from Mumias Sugar, you might think they have not been with sponsorship for two years, people like INGO put Food first before the Club. Shame on you AFC Fans. Penalty is not aclear goal, on Friday Mboya keeper of Mathere United fouled Arita on D-Area and the penalty was awarded, Arita didn’t score why somebody pretending to be a Soccer lover should threw Objects in the Field the people like INGO, want justify that security, last year they beat us 3-1, did Gor Mahia Fans threw Objects in the Field, AFC, FANS has loose the forcast on fare-play they better go and support Rugby not Football. First and foremost I would like to say that both sets of fans misbehaved and it all started at the ‘border’ where AFC fans and Gor Mahia fans started throwing stones and objects at each other. Same hooligans usually destroy other people’s property in town after every match so it’s not a 100% about Gor Mahia and AFC. Let me ask why was there too much commotions between police and fans in CBD after the match yet the match was not played in town but at Nyayo? Organizers equally failed. They informed us there would be about three hundred police officers but the number I saw, if maximum could be about fifty. Even the approximate 50 police were overpowered by the less than 1,000 AFC fans so I wonder whether they were seriously trained police officers or jokers. These police officers ran to hide where players were though we can argue that they went to protect the players. Next time some police officers should be dispatched to sit at the border of the two opposing fans. On the actual match, AFC leopard’s goalie started the whole mess by walking away with the ball. This match I am very sure Gor Mahia could have won clearly but AFC had other agenda apart from playing. No-wonder they kept on creating tensions throughout. If our players are at risk of being stoned then it is better the game be played in an empty stadium or we treat it as a draw and move on. Guys , is it true that Olunga is leaving for trials and that was his last game? Where does that leave him with his studies? I don’t think there is any truth in that. Let us treat it as a bad roumer..
Boniface ambani in his preview said that AFC will surprise gor. I think he was right bcose AFC indeed used their fans to cause abandonment when many always except gor fans to cause abandonment. One thing was a wonder. Leopards players didn’t even try to calm down their unruly followers as we have always seen gor players do. It is very clear on supersports’ cameras who threw their goalkeeper with objects.Media not gor this time. Gor still remains unbeaten and the run away league leaders…..current champions and champions in waiting, season 2015. What has ingwe to show???!!! Now what if kagere could have failed to convert the penalty??? All said and done,today is tuesday,how much was collected in terms of gate collections?